The Presidency for Turks Abroad and Related Communities (YTB) has said it is prepared for thousands of Turkish expats returning to Europe after spending the summer in Turkey. The state agency, founded in 2010, help and coordinate activities for Turks living abroad and Turkish expats. Every year hundreds of thousands of Turks living in Europe return home for summer holidays. Besides visiting family and friends, many expats are motivated by the opportunity children get to learn the Turkish language and culture. 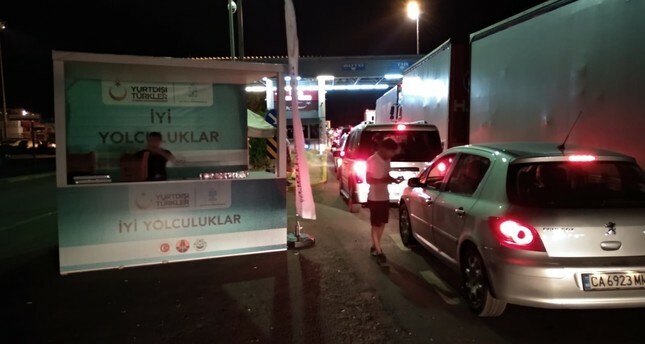 As they start returning to Europe, huge lines of cars form near Turkish customs gates with Bulgaria, which suffers from a lack of personnel. This year the YTB has implemented a new action plan to make the wait as hassle-free as possible. It has installed mobile bathrooms and garbage disposal points along the route and distributed free bottled water and some other essentials. It also handed out brochures containing useful information, including details on the Trade Ministry website that allows early registration of vehicles for easy admission and the YTP phone app that provides useful information about passports, customs, health services, security, transportation and military service, compulsory for all Turkish males once they turn 20.